BUCHAREST CONFERENCE GIVES A STRONG BACKING TO PRESIDENT NAZARBAEV PLANS TO REFORM OSCE. The conclusion of OSCE Conference held on Bucharest was an optimistic one: OSCE is still having a future and a role to play on the old continent. In the presence of the European elite of diplomacy and foreign policy experts the Conference on OSCE was a real success proving that Europe is still capable in offering solutions and intellectual debates with relevance for the XXI century. The OSCE 2010 conference held in Bucharest was a success for Kazakhstan President Nursultan Nazarbaev that has have the courage to launch an ambitious reform plan for OSCE and the intelligence to ask for an intellectual, diplomatic and academic response from Europe. Bucharest conference proved that there is a European support for these initiatives. The Bucharest conference on OSCE was a success for Romania that assumed a leading role in intellectual and academic debate on OSCE reform and was able to host a grandiose conference offering a leading support to OSCE by powerful voices as President Emil Constantinescu, President Ion Iliescu, Professor Anton Caragea, and Professor Ioan Cezar Coraci. Finally the Bucharest Conference was the only one organized in the European Union proving a European capacity to participate in world debate and to act in support of OSCE reform plans. The Bucharest Conference on OSCE in 2010 was from the beginning planned as a response from civil society , foreign policy experts and key European political figures to plans of reform launched by Kazakhstan Chairmanship of the Organization for Security and Cooperation in Europe . The Bucharest Conference held on 24 February under the high patronage of Institute of International Relations and Economic Cooperation , Kazakhstan Diplomatic Mission in Romania and European Council on International Relations was a response of European structure to the key proposal launched by President Nursultan Nazarbaev in his Vienna speech calling for a global European response to OSCE crisis. The Bucharest Conference on OSCE was a clear signal that OSCE is regarded as a powerful actor with a long history and a potential determinant future role in world affairs . All the speakers underlined there support for President Nazarbaev views that : “OSCE is an organization that cannot be replaced. Its stagnation or disappearance would create a volatile vacuum in the Euro-Atlantic area”. While Former President Ion Iliescu of Romania emphasized on the OSCE necessity in carving a new economic reality after the collapse of communism and the capitalism crisis .The globalization process itself is under scrutiny and OSCE is determinant in building a new world model of integration with respect to nations and with support for poor nations . The Bucharest Conference was declared as the place where “everybody who is anybody“in foreign policy debate could express his views on OSCE future, a wealth of fundamental reports varying from OSCE and human security, OSCE at crossroads, OSCE and the economic crisis solution, OSCE and the environment gave a clear assessment of today`s reality of the organization and of the future role of OSCE. Concluding, the Conference on OSCE 2010. A decisive year for Europe . Kazakhstan Presidency was a clear success fulfilling his role as a large, European and representative forum on debate on the future of OSCE . 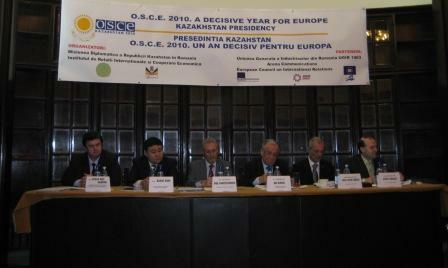 The academic and intellectual response of Europe was an energetic support for Kazakhstan vision on reforming the OSCE. Now that the Bucharest conference has concluded and Europe give an academic support to OSCE reform is the time of decisive action`s in a decisive year for Europe . 2010. Kazakhstan Presidency . Bucharest host the Conference : OSCE 2010. A decisive year for Europe. Kazakhstan Presidency. 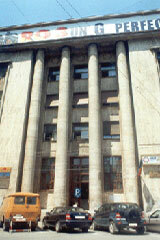 On 24 February 2010 Bucharest will host the Conference : Organization for Security and Cooperation in Europe in 2010. A decisive year for Europe. Kazakhstan Presidency, the conference is supported by European Council on International Relations as a moment to mark Kazakhstan Republic assumption to OSCE Chairmanship . Professor Anton Caragea , the President of European Council on International Relations will also attend the Conference on OSCE meeting and will have a welcoming speech. The Conference is organized by the Diplomatic Mission of Republic of Kazakhstan in Romania and the Institute of International Relations and Economic cooperation in order to mark the assumption to OSCE Chairmanship by the Republic of Kazakhstan . The Republic of Kazakhstan has proposed an ambitious project to reform the Organization for Security and Cooperation in Europe under the for T banner: Trust, tradition, Transparency and Tolerance. The well constructed plan to reform OSCE and the present day situation of the organization perceived in an European and Romanian perspective will be the main objectives on the conference agenda. Bucharest Conference will have video message from Kazakhstan Republic President H.E. Nursultan Nazarbaev , Minister of Foreign Affairs of Kazakhstan and Office Chairman of OSCE ,H.E. Kanat Saudabayev . Will debate the important theme`s on the agenda H.E. Emil Constantinescu President of Romania (1996 -2000 ) , H.E. Ion Iliescu, President of Romania ( 1990-1996;2000-2004 ) , Mr. Ioan Cezar Coraci , president of UGIR-1903 , Mr. Nechifor Catalin Ioan , parliamentary , vice-president of Romanian- Kazakhstan Parliamentary Friendship Group. Also the participants will be welcomed by the speeches of H.E. Kairat Aman- Diplomatic Mission of Kazakhstan Chief and Professor dr. Anton Caragea- director of Institute of International Relations and Economic Cooperation. On 15 of January 2010 the Institute of International Relations and Economic Cooperation from Romania becomes the newest member of United Nations Global compact Initiatives .The Global Compact action of United Nations is focused on ad advanced principles as: human rights, labor standards, environment and anti-corruption. In the welcoming note for professor Anton Caragea , director of Institute of international Relations and Economic Cooperation, Mr. Georg Kell the Executive Director of United Nations Global Compact Office wrote: “we applaud your leadership in making this decision and welcome your organization`s engagement in the Global compact- the world`s largest corporate initiatives ..from the beginning, the Global Compact has considered that your participation helps to foster this collaborative spirit which is so critical for tackling today`s challenges.. again, we thank you for joining the Global Compact. We are eager to hear your ideas and experiences, and encourage you to share your views with us. We stand ready to support your efforts”. 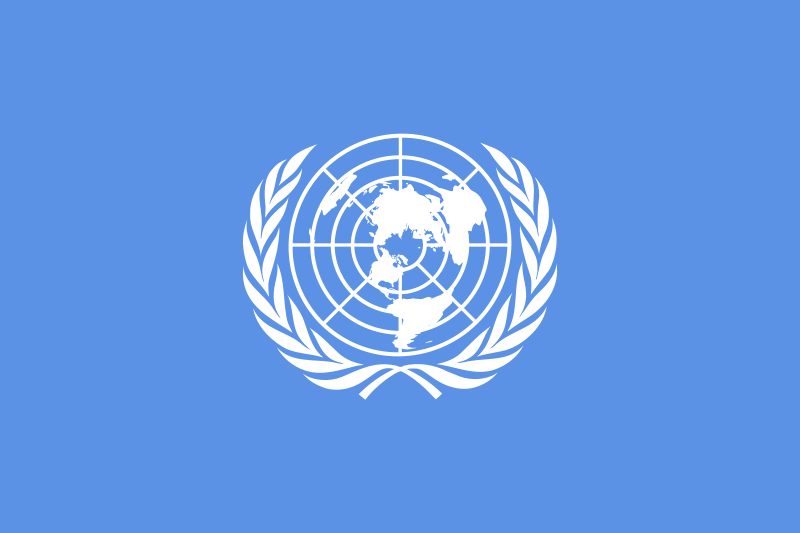 The acceptance of Institute of International Relations and Economic Cooperation in the United Nations framework is a proof of the advancement of foreign policy research and activities in Romania and there global impact, furthermore the Institute of International Relations and Economic Cooperation is the only Romanian institution ever accepted in the Global Compact of United Nations.